Encore Magazine praises The Children's Hour's "standout performances"
The Star News hails Beauty and the Beast as "delightful"
Student theatre company STAGE Co.'s The Red Lamp plays October 27-30. 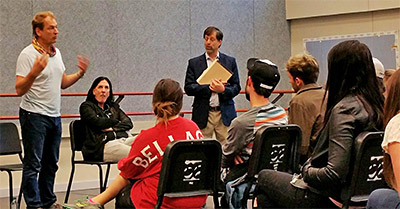 Encore Magazine hails Mad Forest as "powerful"
ETEAL applied learning award to Professor Castagno funds his THR 321 Theatre History Class's April 5 exploration into the archives at the Folger Shakespearian Library in Washington DC. John Staton's dimensional review of The Burial at Thebes praises UNCW students' acting and designers' choices. Paul Castagno discusses The Burial at Thebes at WHQR's Midday Interview. 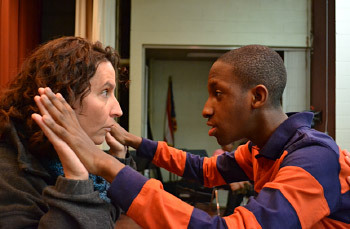 The Star News commends solid acting in Grimes' Death of a Salesman. Julian Sands speaks to theatre students about life as an actor.